Verdict - Akshay Kumar delivers another winner with his best performance to date! India has a population of over a billion people and almost 48 % of these are women. As per different studies conducted by various organizations and think tanks, a majority of women here still don't have access to proper means of menstrual hygiene and have to use unsafe methods which damage their health. Arunachalam Muruganantham, a social activist from Tamil Nadu brought a revolution on his own by providing affordable sanitary napkins to millions of rural women. The film PadMan is inspired by his life and is also based on the book the legend of Lakshmi Prasad by Twinkle Khanna (also the producer of the film). Akshay Kumar stars as Lakshmikant Chauhan, a simple man living in a village in Madhya Pradesh along with his mother, sisters and his wife, Gayatri (Radhika Apte). He has a knack for solving the problems his wife faces on a day to day basis and loves to make her happy. When he sees how his wife (also his sisters and other women of his village) is shut out from home when she is on her period and won't use a sanitary pad as it's too costly, he decides to take matter into his own hands and starts developing a pad that's not too costly. He fails spectacularly numerous times and is even ostracized from his village but keeps working on to develop the pad that would give his wife the dignity she deserves, even though she leaves him. Enter Sonam Kapoor's Rhea, an MBA graduate who decides to help Lakshmi to fulfil his dream and also helps him market the product the right way. The film gives special attention on empowering women in the rural areas through entrepreneurship, education and skill development. It also shows how selfless Lakshmi is as he passes on the chance to have his product patented which would have brought him millions of rupees. The film never feels stretched during its entire runtime and credit goes to Akshay Kumar to keep the audiences engaged with probably his best performance to date. His Lakshmikant is a man of perseverance who has the determination of a mad-genius. It is his fight with these age-old customs and traditions that still don't allow women in rural India the access to basic hygiene. The film also cements the fact that there is no leading man better than Akshay Kumar in comedy. 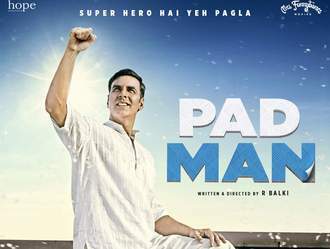 PadMan is a personal story in its first half where a man decides to do everything in his power to help his wife and both Akshay Kumar & Radhika Apte portray their characters effectively. In its second half, the film shifts its focus to the social revolution that Lakshmi starts after meeting Rhea and begins empowering women in the rural areas. The film implies that there are a lot of geniuses in rural India, who, with proper mentoring and help, can transform the nation. Sonam Kapoor gives a refreshing performance as Rhea and her arc is important to the story as she helps Lakshmi to become PadMan. She stands resolutely behind him and single-handedly markets his product. The film also showcases how a nation can progress if youngsters start working for the people instead of taking high-end jobs. PadMan is funny and amusing throughout while it also educates the masses about the importance of menstrual hygiene and women empowerment. The film refers to the elephant in the room without discomforting the viewers as people are still afraid to talk about these topics in the open. R Balki has made a film that not only entertains but also educates the people. It is neither too preachy like Toilet: Ek Prem Katha nor overtly dramatic like PK. The only glitch is the unneeded romantic plot which could have been avoided (won't spoil it for you). The film is a perfect ode to empowering women which will, in turn, empower India. Padman Review: A film that was “needed” to be made. Based on the real life story of Arunachalam Muruganatham, this R. Balki ticks all boxes right in delivery a much needed menstrual awareness through an inspiring real story. Seeing his wife struggling during her menstrual cycle who uses cloth and concerned over the same, Lakshmikant Chauhan (Akshay Kumar) urges to replace cloth with disposable sanitary napkins. But his wife and family annoyed over his obsession with female hygiene abandon him and she leaves him. He then sets out on a mission to make cheap sanitary napkins to help the women all over. Will he be able to realize this “unrealistic” dream of his? Given the amount of taboo and awkwardness which surround over menstruation, this film is a one which was needed to be made and most importantly, is needed to be watched. The film had awareness, education and entertainment going hand in hand. And they almost go well except in some parts where the audience may find it too preachy. But well according to me, the teachings of the film are what makes it very important. The entertainment quotient though with Akshay Kumar’s convincing performance almost never goes down. Akshay Kumar with a long list of content driven films behind doesn’t disappoint and gives a noteworthy performance. Radhika Apte in her small town conservative avatar does exceedingly well and reflects the turmoils and emotions of a woman quite aptly. Sonam Kapoor has though short but quite a significant role which she does complete justice to. We need to give special mention to the writers who did quite well. Especially, the speech delivered by Akshay at the UN made the audience in the theatre stand up and applause. Akshay Kumar starrer Padman is a delight for the eyes. The story is simple and the charm of the movie lies in the simplicity which it has managed to put forth in an almost elegant fashion. Based on a true story, this movie is about a man and his quest to a hygienic life for his wife. Lakshmikant Chauhan lives in a village in Madhya Pradesh with his wife Gayatri He is a problem solver and thrives to make his wife happy. However, he soon discovers the problems his wife and sisters face when on their menses. Moreover they cannot afford sanitary napkins as they’re too costly, hence he sets out on a journey to design cost effective sanitary napkins for women. After several failed attempts, constant jeer from village men, and his wife leaving him; he succeeds. Padman is a story of women empowerment. In backward areas and sometimes even in urban areas, where menstruation is a taboo. This film calls out to the struggle a woman face when on her periods and how much more difficult it is if she doesn’t have access to clean sanitary pads. Akshay Kumar is the best suited actor for his role and is a part of the recent change in his selection of movies. The film doesn’t have any dull moment and it keeps the audience entertained through. It’s a good educational movie in the garb of entertainment. The film deals with the hitherto taboo of menstruation. It is only Akshay Kumar who could pull off such an unconventional role with such ease and finesse. The scene wherein he rides a cycle to test the pad made by him, and which eventually starts leaking on his pants, is an immensely difficult scene to portray on the big screen. Akshay’s courage is commendable. The film’s first half drags a little and it starts resembling a documentary on menstruation. It is only when Sonam enters, that the film’s plot becomes interesting. Although Sonam’s entry helped the film progress, but her falling in love with Akshay was uncalled for and looked a little out of place and forced. Go for Akshay, stay for Sonam. Padman, directed by R.Balki stars Akshay Kumar, Sonam Kapoor and Radhika Apte in lead roles. It has been inspired by the life of Arunachalam Muruganantham, a social activist from Tamil Nadu who introduced low-cost sanitary pads. The story revolves around Lakshmikanth Chauhan, played by Akshay Kumar, who is happily married to Gayatri(Radhika Apte) and would go to any extent for her happiness. When Gayatri is temporarily banished from the household during her menstrual periods, Laxmi is caught unaware due to his lack of knowledge about the subject which is otherwise referred to as 'five day test match for women' by the village youth. As the story proceeds, Laxmi pledges to fight the taboo surrounding the issue of menstruation and menstrual hygiene. By a chance of events, Lakshmi meets Pari walia(Sonam Kapoor), who helps him in his mission and eventually also develops a soft corner for him but yet, dismisses her own feelings for the sake of Lakshmi’s happiness. The film starts on a slow note before gaining its momentum. Akshay Kumar as the common man Lakshmikanth Chauhan fits the role perfectly and genuinely helps to spread awareness about the hush-hush topic of menstruation and its hygiene. Radhika Apte as his homely and shy wife Gayatri plays her character well and so does Sonam Kapoor as Pari Walia, giving the film a breath of fresh air. Padman, if not something out of the box or extraordinary, definitely touches upon an issue which in today’s time needs to be discussed openly without any inhibitions or prejudices and the film has therefore, helped in spreading awareness about it. So, if you want to get a dose of reality and watch something other than the quintessential romantic or action movies then Padman is definitely worth a watch. When it comes to a social agenda, Akshay Kumar has left a great impact on the audience with his performances. Be it airlift or toilet. Pad Man was yet another movie in the genre and Akshay gave his one of the best performance giving us a sweet taste of his acting which was very different from his action or comedy avtaar. As name suggests, the movie revolve around Lakshmi kant who is obsessed about making pads for the health safety of her wife during mensuration days, what leads is the chaos. The movie beautifully brings out the taboo which follows the indian culture and thinking of society. The struggle Lakshmikant starts to make pads for his wife turns into a beautiful journey of him finally making the pad and also getting recognition at national level. Its impossible to not fall in love with Radhika apte even when she does a small role. she bought out the village women's character and looked beautiful while doing it. The pinch of love between Lakshmi and Gayatri is beautifully portrayed. Sonam kapoor did a good job as supporting actress but fails to effect audience with her acting skills and clearly got lost in the charm of akshay.